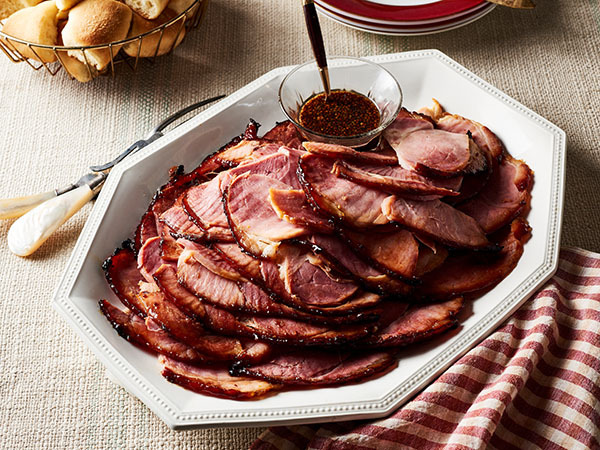 Dale's Glazed Spiral Cut Ham is a family holiday favorite. This recipe calls for spiral cut ham, brown sugar, and Dale's Seasoning. Try pairing Dale's Glazed Spiral Cut Ham with Dale’s Green Beans for a full holiday meal. To begin making Glazed Spiral Cut Ham made with Dale's, preheat oven to 350°F. Then, place ham into a large roasting pan. Cover with foil and place in the oven to heat through the center, about 1 ½ - 2 hours. Meanwhile, in a small saucepan, combine the pineapple juice, Dale’s seasoning, apple cider vinegar, brown sugar and red chile flakes. Next, cook over medium-high heat until simmering, whisking frequently to dissolve the sugar. Reduce heat to medium and let cook until reduced by 2/3rds (to yield 1 ¼ cup), about 20 minutes. Remove from heat, whisk in the mustard, and set aside. Then, remove the ham from the oven. Measure ¼ cup of the juices from the bottom of the pan and set aside. Continue to brush the ham all over with the sauce. Return it to the oven, uncovered, for 10 minutes. Remove, brush again, and return for another 10 minutes. Next, remove once more, brush again, and return to the oven for a final 10 minutes. Remove ham from the oven and let rest for 15 minutes in the pan, then transfer to a serving platter. Finally, whisk the reserved ¼ cup of pan juices into the remaining glaze and serve alongside the ham.